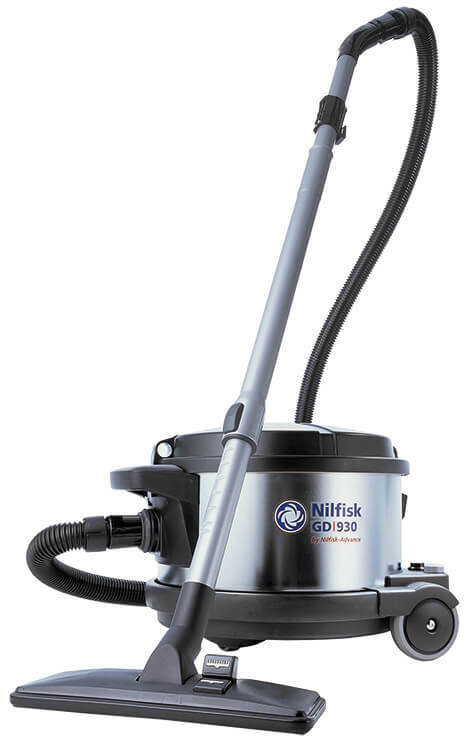 Fully equipped to safely collect hazardous lead dust generated during renovations, the Nilfisk RRP vac exceeds the EPA’s standards of a HEPA-filtered industrial vacuum cleaner. The vacuum’s multistage filtration system features a certified HEPA filter that captures 99.97% of dust, down to and including 0.3 microns. It’s tremendous suction power and durable construction make it a top choice for contractors. Large wheels, castor, low profile and convenient carrying handle make it exceptionally easy to use. This vacuum can be used in conjunction with vacuum-assisted power tools to collect hazardous lead debris at the source. The RRP vacuum is available with a turbo nozzle or power nozzle, both equipped with a beater bar to dislodge heavy lead particulate that may be embedded in carpet. The turbo nozzle uses the working air of the vacuum to spin the beater bar, while the power nozzle runs on electricity. Both are extremely effective in agitating the carpet to collect heavy lead debris that may have settled in the fibers. Dimensions (L x H x W) 17.5 x 15.0 x 13.0 in. We’ve earned our spotless reputation by consistently producing top-quality vacuums and offering the industry’s most complete selection of vacuum filtration options, attachments and accessories. If you don’t find what you are looking for, please let us know. We make every attempt to respond to all customer inquiries within a 24 time period.